Keep your spectacles, smartphone screens and even telescope lenses clean and smudge free with this Cable Car lens cloth. 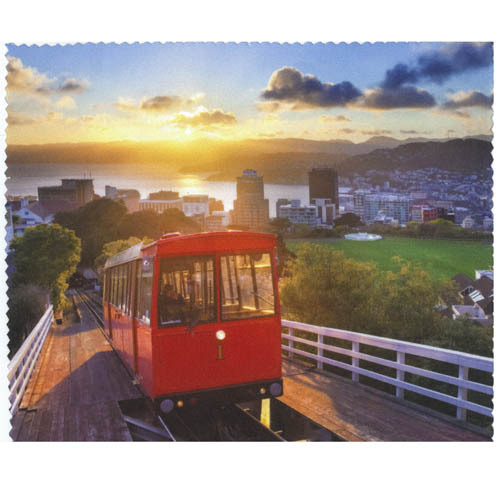 This lens cloth features a stunning image of Wellington’s iconic Cable Car climbing up the hill against a glorious sunrise and the Wellington harbor. Designed to care for coated lenses and delicate devices, and most importantly removes smudges and fingerprints easily. The Cable Car allows easy access from its terminal on Lambton Quay to the top entrance of the Botanic Gardens and the Cable Car Museum. It’s a favorite of locals and visitors alike! So make this lens cloth a practical way to remember a trip to the capital city. It also makes a great gift for a Wellingtonian ex pat. Customers can also purchase this product in store at the Wellington Museum and the Cable Car Museum. This item is exclusive to Museums Wellington,as a part of their custom Cable Car range aimed at celebrating this iconic Wellington symbol.